Leslie Buck, designer of a NYC coffee icon, RIP. – Dear Coffee, I Love You. Leslie Buck, designer of a NYC coffee icon, RIP. If you’ve ever been to New York City, there’s a good chance you’ve come across the Anthora coffee cup. 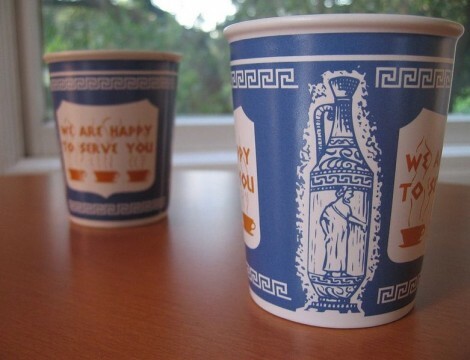 Leslie Buck, who passed away this week, initially designed the cups to target the large population of Greek Diners in NYC and it went on to become a coffee icon throughout the city for decades. A pop-cultural totem, the Anthora has been enshrined in museums; its likeness has adorned tourist memorabilia like T-shirts and ceramic mugs. Like many once-celebrated artifacts, though, the cup may now be endangered, the victim of urban gentrification. Though their use has declined, the Solo Cup company, who absorbed the original maker of the cup, sold 200 Million of them up in 2005 when they began to only offer the Anthora design by special request. However, a few years ago, Graham Hill (founder of Treehugger) began making ceramic replicas of the cup for all those fans who want to reduce their waste, without giving up their sacred Anthora.